This is a great one. For serious. I’m calling this a salad because, well, I don’t know what else to call it. It’s a party in your mouth, is what it is. 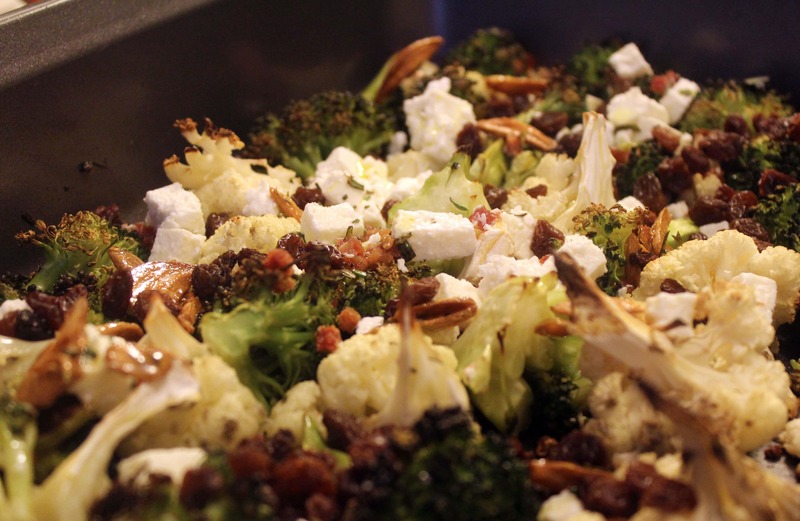 But that’s not really a commonly used category of food so….warm salad it is! This, my friends, is delicious. 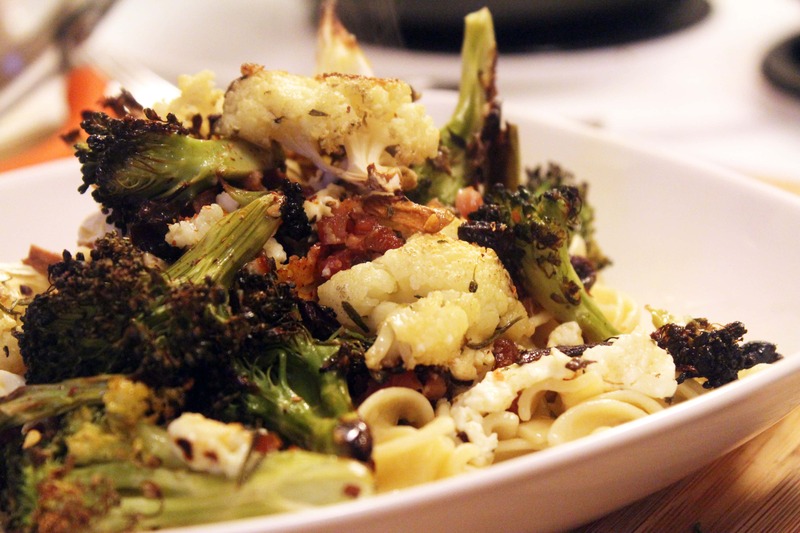 Side dish, salad, pasta-topper…this can be anything you want it to be. 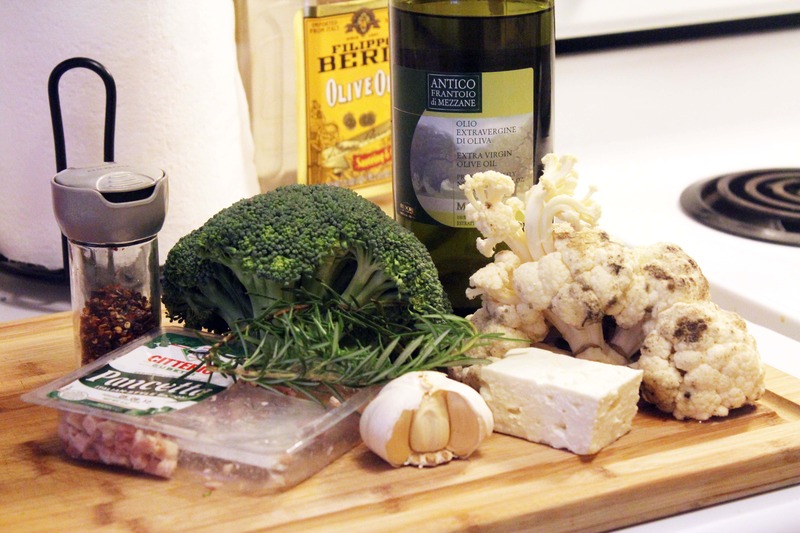 First, we’re going to prep the toppings and make garlic infused oil. 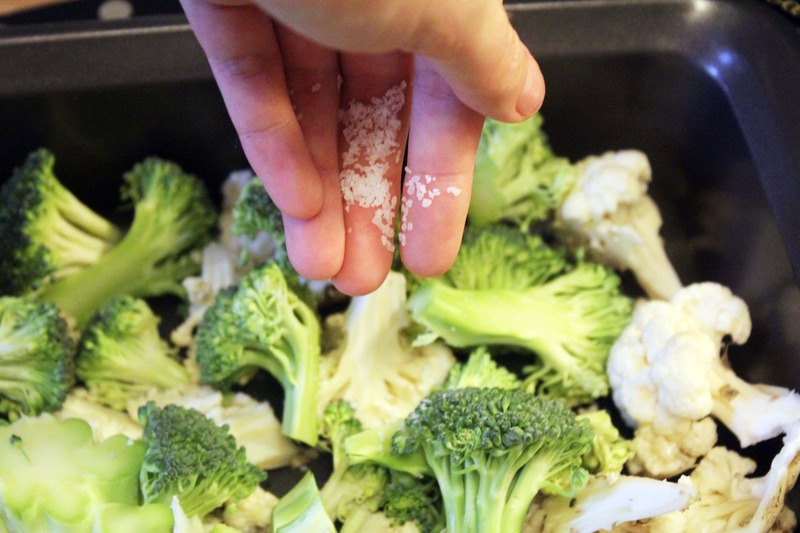 Oh hey, in case you were wondering, this is what happens to cauliflower if you keep it in the fridge for 98 days! It keeps growing. It tastes fine, though, so no worries. 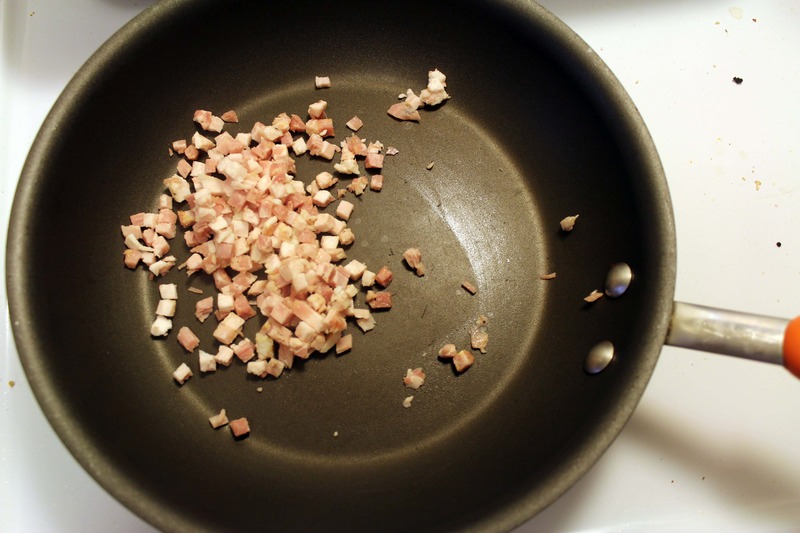 I had this handy pre-diced pancetta, which is fabulous. 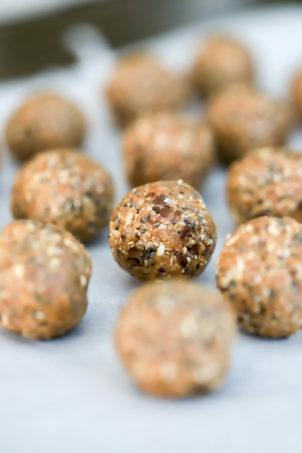 If you have a big hunk of meat (hehe), just dice it up into small bits. 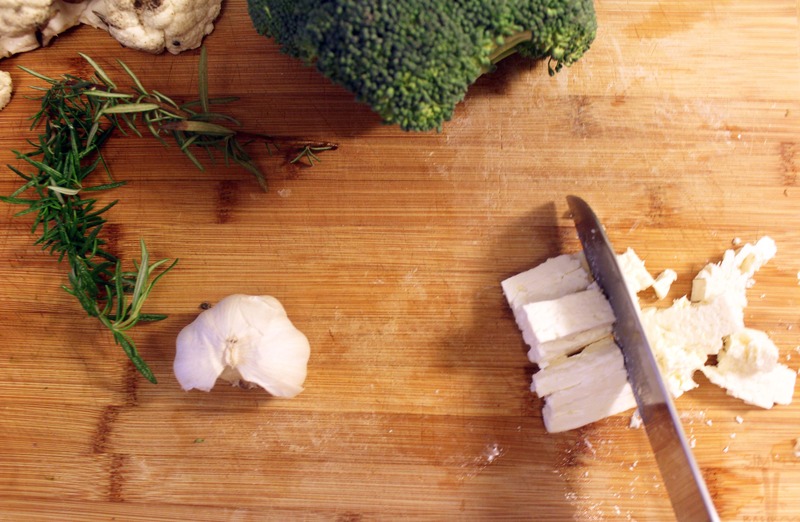 Dice the cheese too, and keep it handy for when we’re ready to use it. 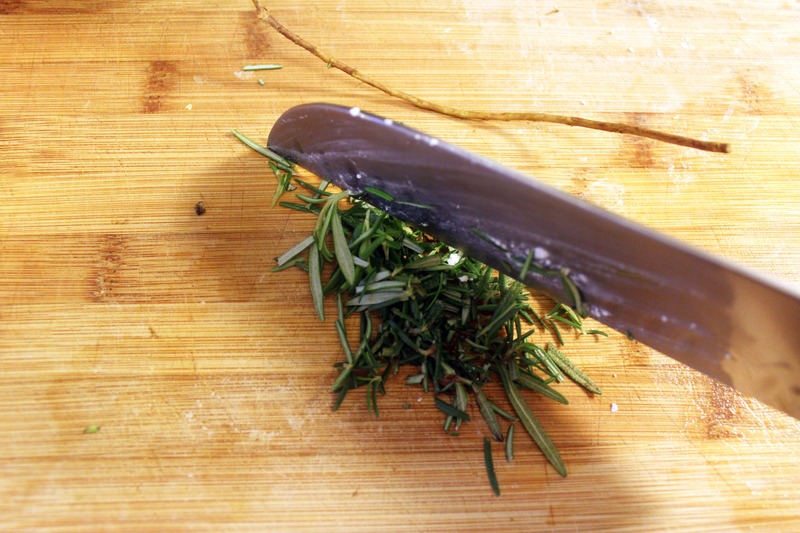 Then strip the rosemary from the stem and chop the leaves into small bits. Mmmmm. I love the smell of rosemary. We were lucky to have some fresh gifted to us from Jay’s bff Adam’s mom, but 1 teaspoon of dried rosemary would be just fine in this dish. 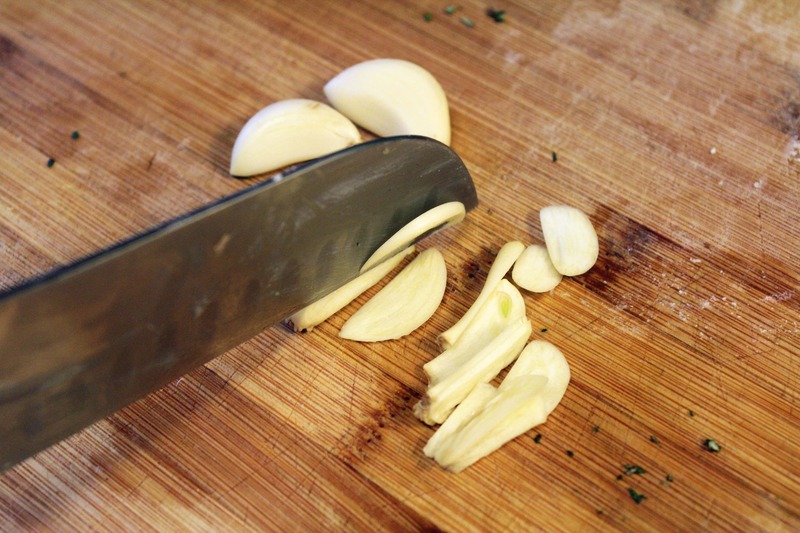 Peel the garlic and slice it thinly, too. 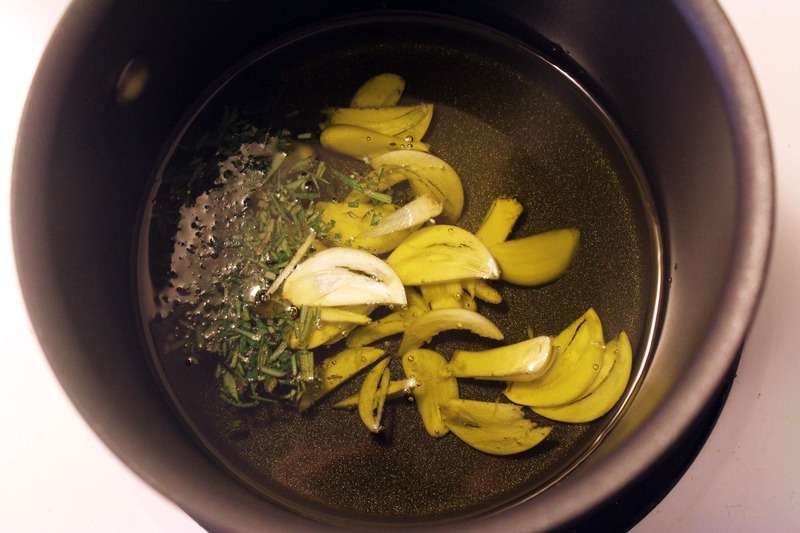 Then, add the olive oil, garlic, and HALF the rosemary to a small pan. 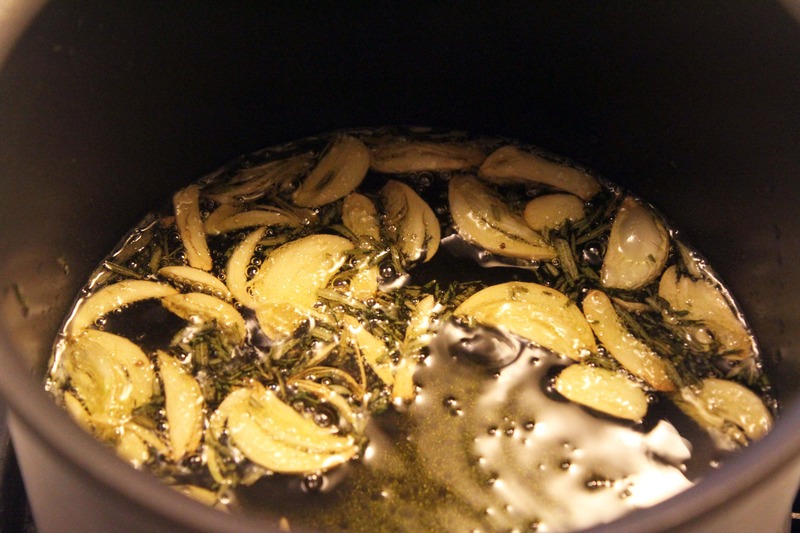 Turn the heat to low and let the oil infuse with the flavors for 10-15 minutes until the garlic is golden brown. YES. Now, we clearly won’t use all this oil for one little broccoli dish, so you’ll have extra for salad dressings, bread dipping, or … drinking? Maybe not. 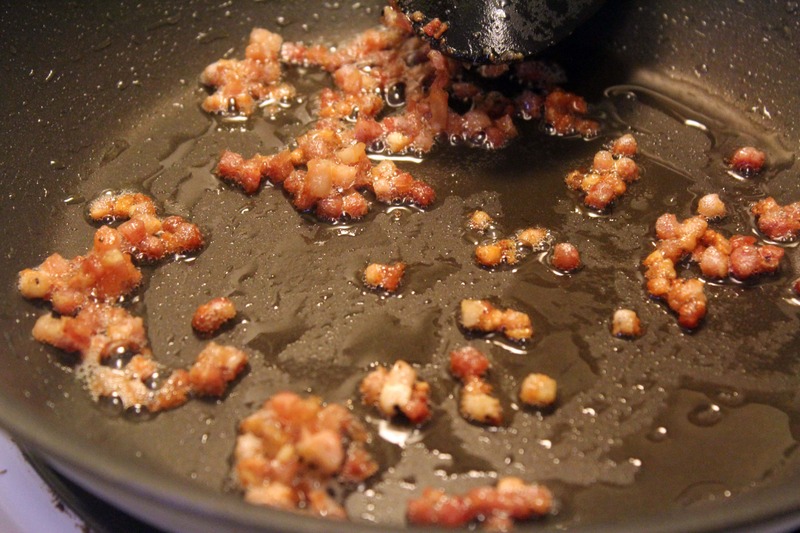 While the oil is infusing, heat a pan to medium-high heat and let the pork product of your choice brown and crisp for 5 minutes or so. Lovely. Now, you have garlic oil. You have reserved rosemary, cheese, and pancetta. Is there anything more to life? Barely. 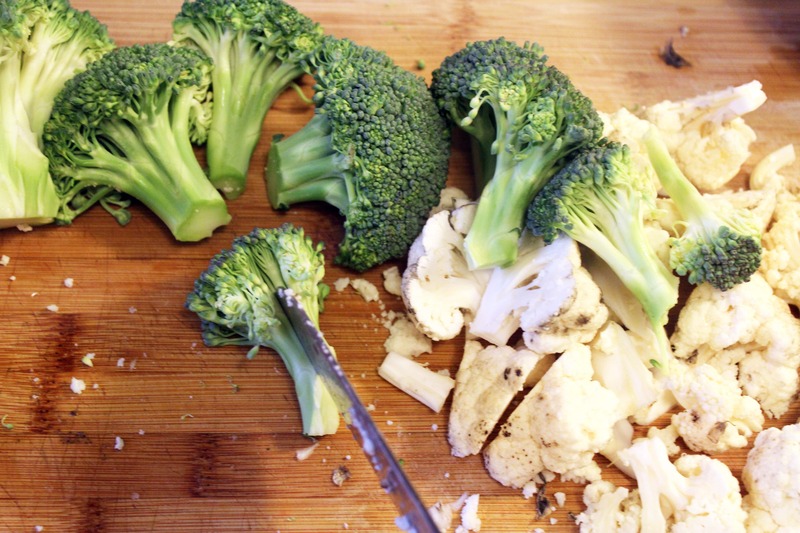 The, cut the broccoli and cauliflower into little bite-sized chunks. 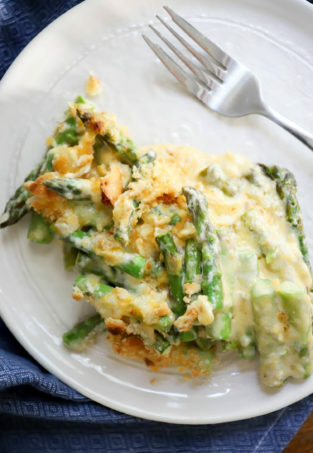 Don’t throw away the stems, they’re edible! Or you can if you’re a wasteful person…that’s your call. 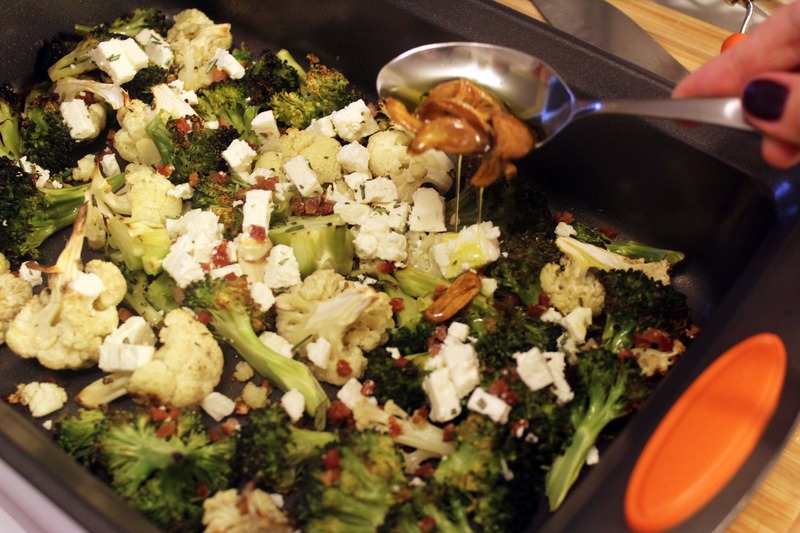 Put the broccoli and cauliflower in a roasting pan and sprinkle it with salt, crushed red pepper, and drizzle it with about a tablespoon of the lovely garlic oil – don’t put any of the garlic pieces on the broccoli just yet – we don’t want them to burn! Mmmmmm yes. 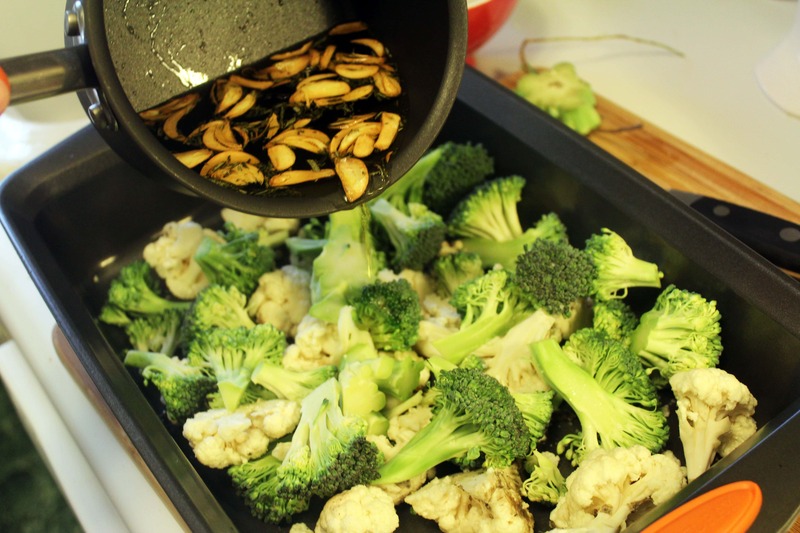 Now, roast the broccoli for 20-25 minutes until the stems are soft and the edges are just beginning to blacken. 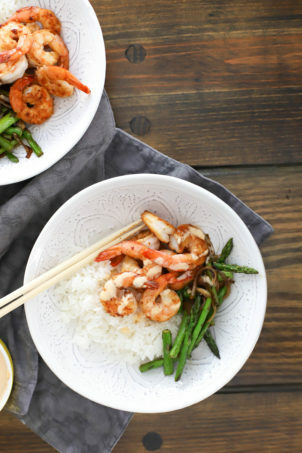 Leave the oven on when you take the pan out at this point! 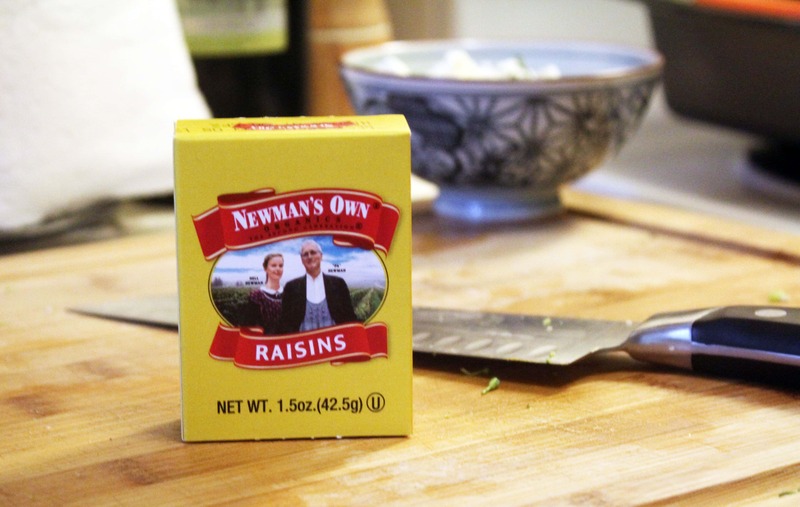 Then, gather up all the reserved topping ingredients – don’t forget the raisins! 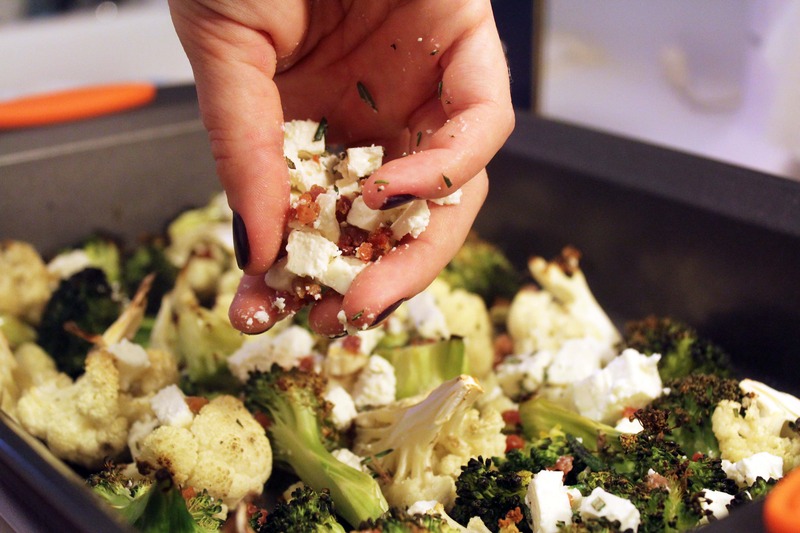 Now, to the mostly-cooked broccoli and cauliflower, sprinkle the raisins, cheese, pancetta, rosemary, and some of the garlic pieces from the oil all over the pan. 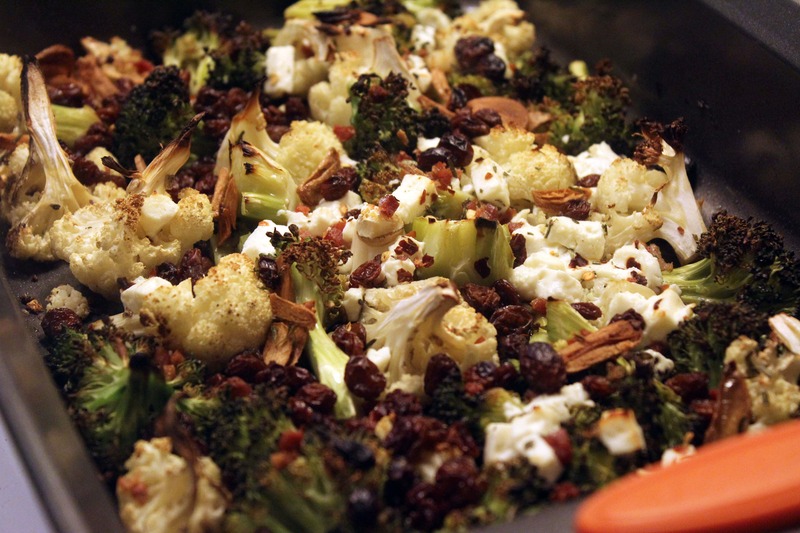 Now, put the pan back in the oven for 5 or 10 more minutes until the cheese barely starts to brown and all the toppings are heated through and the broccoli and cauliflower is even more deliciously roasted and has crispy edges. Oh my YES. This is so great! 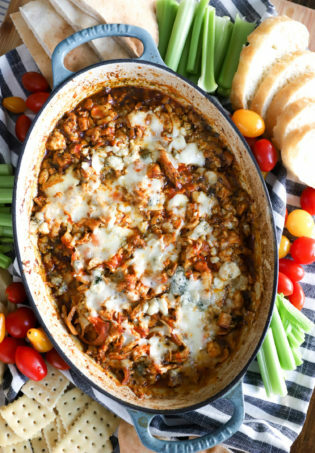 Perfectly delicious with bites of salty cheese, meaty pork, light vegetable, and sweet raisins running throughout . 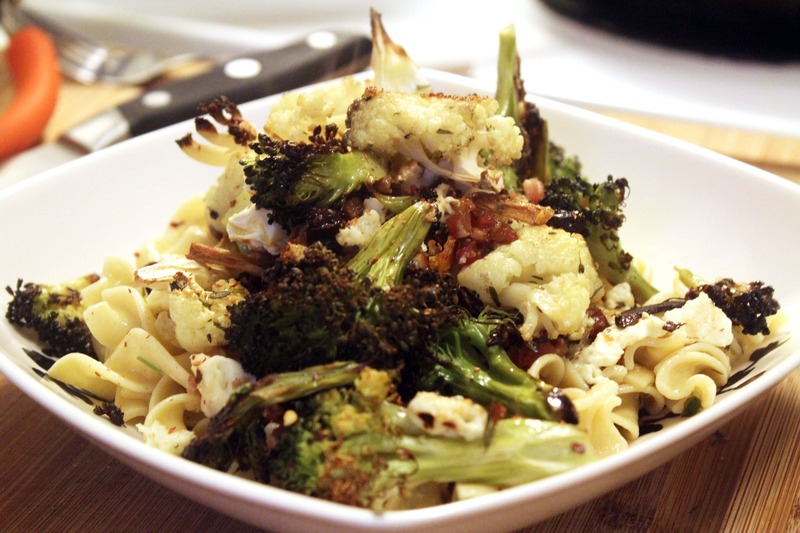 Serve this as a salad, side dish, or over pasta like I did here. You can’t go wrong!